Rosé is the flavor of the summer. But we didn’t even realize it was a flavor at all until products like rosé-flavored gummy bears and rosé-flavored lip balm entered our lives. But we’re definitely not mad about it. Because rosé all day is a thing for a reason (because it’s refreshingly delicious, obviously). Well, once again, the rosé gods have bestowed upon us another rosé product, and it’s everything we’ve ever dreamed about. 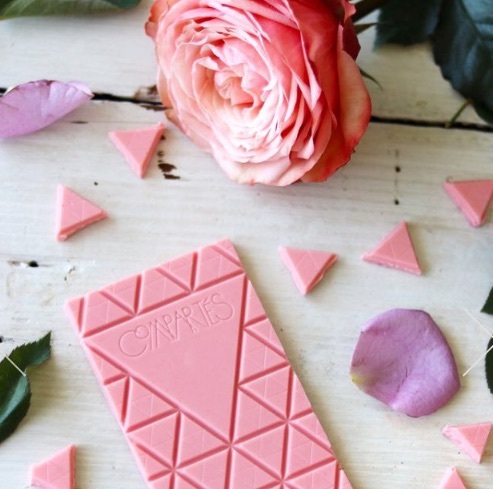 Rosé chocolate finally exists, you guys! Okay, so it doesn’t exactly come from the rosé gods — it hails from a company called Compartes. The Compartes Roses & Rosé Chocolate Bar is everything we’ve ever wanted in chocolate. The bar retails for $9.95, but shipping is an additional $8.95 or more — which makes the chocolate bar pretty pricey. But probably worth it (as long as it doesn’t, you know, melt). You can buy one (or a plethora of them) here. And just for your knowledge/viewing pleasure, Compartes also makes some other really ridiculously delicious-looking chocolate bars.